Brunch is the perfect Sunday companion. It will let you enjoy a lazy Sunday morning and savor a meal that bridges light and hearty fare. 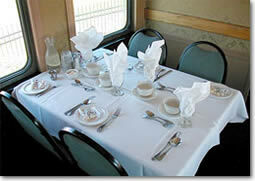 Put this crowd pleasing favorite aboard a scenic train that passes the iconic marshes and dunes of the Cape and glimpses of the bay and you are assured the enjoyment of every member of your party. Sundays at 11:30 am, returning at 1:30 pm. Please note that prices shown are round trip, and do not include taxes or fees. Prices, schedules and terms can change without notice.